Added 'Open Selected File With' option. Added 'Filename Only' column, which displays the filename without the full path. 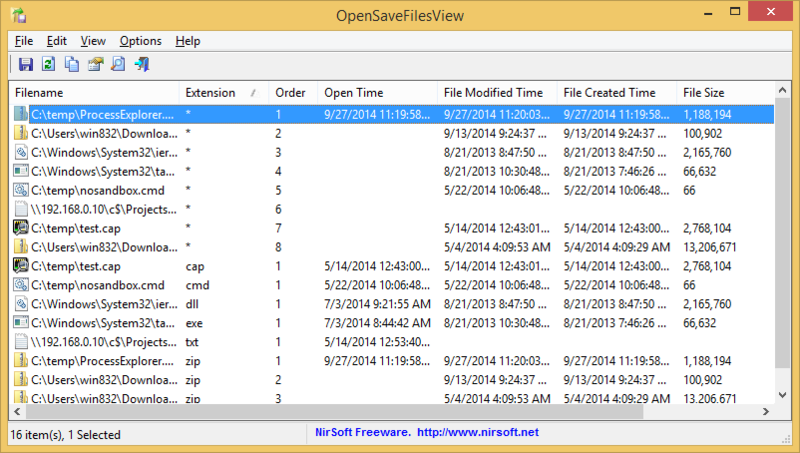 Explorer context menu inside OpenSaveFilesView: When you right-click on a single item while holding down the shift key, OpenSaveFilesView now displays the context menu of Windows Explorer, instead of the OpenSaveFilesView context menu. This feature only works for existing files. Added 'Open Filename Folder' option. Added 'Open Selected File' option. /stext <Filename> Save the list of opened/saved files into a regular text file. /stab <Filename> Save the list of opened/saved files into a tab-delimited text file. /scomma <Filename> Save the list of opened/saved files into a comma-delimited text file (csv). /stabular <Filename> Save the list of opened/saved files into a tabular text file. /shtml <Filename> Save the list of opened/saved files into HTML file (Horizontal). /sverhtml <Filename> Save the list of opened/saved files into HTML file (Vertical). /sxml <Filename> Save the list of opened/saved files into XML file. A file named OpenSaveFilesView_lng.ini will be created in the folder of OpenSaveFilesView utility. After you finish the translation, Run OpenSaveFilesView, and all translated strings will be loaded from the language file. If you want to run OpenSaveFilesView without the translation, simply rename the language file, or move it to another folder. OpenSaveFilesView is also available in other languages. In order to change the language of OpenSaveFilesView, download the appropriate language zip file, extract the 'opensavefilesview_lng.ini', and put it in the same folder that you Installed OpenSaveFilesView utility.